On October 12th, Hatsumi Senei will present an 演武会 embukai, a martial demonstration, in celebration with 東海時 Tokaiji Temple and 布施弁天 Fuse Benten. This year marks the 1200th anniversary of the founding of the temple in Kashiwa City, Chiba Prefecture. At this temple, Benten, the Japanese version of the Indian deity Saraswati, is enshrined. In either guise, she is a goddess of poetry, music, art and learning. She is often depicted holding a biwa, protected by a dragon, as she is at Enoshima Island, or white snakes, which are said to live at Fuse Benten, and near water as, in her native India, she is a river. Of the 七福神 Shichifukujin, Seven Gods of Good Fortune revered in Japan, she is the only female deity. 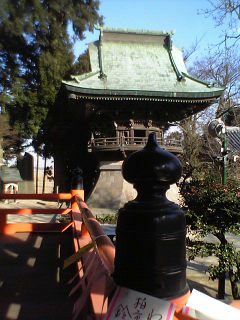 Each time I go, I make my offering of a prayer and a bit of coin, maybe buy an amulet, or bring a friend. The balance in the giving is receiving, and every time I go, I am given something. A few years ago, on an early spring day, I was invited in for tea and to see devotional paintings in the rectory. Other times, Benten has yielded beautiful spring flowers and fall leaves, little glimpses of local history and Buddhist lore, and always some image in the temple’s decoration emerges, something that illuminates an idea encountered in budo. On a visit this summer, my friend M and I rode 20 minutes by bicycle from central Kashiwa to Fuse Benten. When we got there, we saw a big basket of eggs set in front of the altar. The eggs were wrapped in paper on which blessings were written. While we were admiring the altar and the statue of Benten, a little grandma came in, knelt on the tatami in front of the goddess image and talked to her like you would an old friend, “Honorable Benten, thank you for everything. Might I take one of these eggs as your blessing? There’s a dear.” Benten is well-loved by the local people. When M and I asked for our fortunes, the priest also handed us each an uchiwa fan with the details of the October 12th celebration in honour of the temple’s 1200th year. On the back, we saw the Togakure Ryu name on the bill. We explained to the priest that we are members of the Bujinkan, and we would do our best in the presentation, and he gave us a few of the blessed eggs. Every time we give something, energy, time, good will, something comes back. What offering can you bring to the embukai? If you are in the embukai, your offering is your art, your budo, and your ability to create suspension of disbelief in the audience. Benten in return inspires us with art, craft, flow and beauty. If you are watching, you bring your wonder and support for those in the embukai, and respect for Japanese culture. On the day, besides the budo demonstration, there will also be taiko drum and dance performances. Some things to bear in mind when you visit – Tokaiji and Fuse Benten are places of worship. You should wash your hands at the basin. This is a way to show you are purified in body and mind before you approach the temple and shrine complex. Ring one of the bells with vigour. This is how you let the gods know you are petitioning. A good coin to throw in the offertory box is 五円 go en, which is a homonym for 御縁 good relationship. As a sign of respect, bow in front of the altar. The usual Shinto formula is two bows and a clap, say your prayer, and bow when you take your leave. To get to Fuse Benten, follow George Ohashi’s directions.